Provide comfort for the family of Irene Kenyon with a meaningful gesture of sympathy. Millinocket-Irene Kenyon, 84,Surrounded by her loving family, our precious Mom, Gram, Great Gram, Sister and Godmother went home to be with her Lord and Savior. Irene was born July 5,1934 in Wytopitlock, the daughter of Leon and Mildred Rosebush; one of twenty brothers and sisters. Irene attended high school in Orono where she met the love of her life, Bill, on the steps of Pat’s Pizza one sunny afternoon. After a brief courtship and marriage Bill and Irene moved to Millinocket where they would spend fifty five years together raising three sons and making fond memories that are too plentiful to count. Irene was a faithful communicant of St. Martin of Tours Catholic church for 65 years. During this time she dedicated and volunteered much of her own time to serving God as a Catechism teacher, Eucharistic minister and also as a member of the Daughters of Isabella and a Sister of Our Lady of the Holy Rosary. Irene devoted much of her time praying the rosary and asking Virgin Mary and all of the Saints to intercede on her behalf to keep safe her most prized possession, her family. 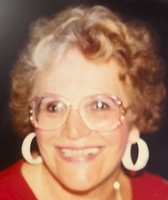 Irene especially loved spending time at camp cooking for her family and doting on her beloved grandchildren whom she considered angels sent from Heaven. Irene looked forward to, and enjoyed very much, her visits with her brothers and sisters to whom she remained very close throughout her entire life. Irene instilled in us a deep sense of devotion to God and family, always providing a sense of stability and examples of patience and kindness for her family to follow. She will be missed here on this earth but the journey she started at Baptism has now carried her home to be with her family gone before her and finally to be reunited with her cherished husband Bill and son, Billy. In addition to her parents she was predeceased by her husband William Kenyon Jr; son, William Kenyon III; siblings, Paul Rosebush, Alice Rosebush, Bessie Modery, Edith Parlee, Frances Goodine, Dennis Rosebush, Thomas Rosebush, Daniel Rosebush and Robert Rosebush. Irene is survived by two sons, Steven and his wife, Diana of Millinocket and Christopher and his wife, Robin of Millinocket; grandchildren, Susan Kenyon and companion, Matt Miller of Loomis, California, Tracy Kenyon and wife, Cara of Sacramento, California, Michael Kenyon and wife, Amy of Laguna Hills, California, Ryan Kenyon and companion, Erica McAvoy of East Millinocket, Sandy Brooker and husband, Paul of Millinocket, Kelly Piskator and husband, Jason of Worcester, Massachusetts, Cole Kenyon, Katie Kenyon, and Kasey Kenyon of Millinocket; great grandchildren, Isabella and Ava Piskator, Brady Brooker, Kylie Kenyon, Jacob and Joey Pankow, Casey Miller, Braxton Kenyon, Lincoln Kenyon, and Lucy Kenyon; siblings, Mildred Hashey, Stella Clement, Lewis Rosebush, Ann Sossong, Charity Richards, Gene Rosebush; and many nieces and nephews. A Mass of Christian Burial will be celebrated 11 A.M Thursday March 21, 2019 at Christ the Devine Mercy Parish, St. Martin of Tours Catholic Church, 19 Colby Street, Millinocket with Rev. Bruce Siket, pastor, presider. Relatives and friends are welcome to a time of conversation and refreshment following the Mass. Burial will be held July 20th 2019 in Millinocket. Arrangements made by Lamson Funeral Home, Millinocket. To plant a memorial tree in honor of Irene H. Kenyon, please visit our Heartfelt Sympathies Store. Interment will be in the springtime. My sincere condolences to the entire family. Mrs. Kenyon was a very special lady who I knew for over 60 years. When I was young I would go the Bill's house to collect the paper money for the kids route and Mrs. K was always so nice and made even a young lad feel welcome in the home. Bill and her were two of my favorite people when I was growing up. May she rest in peace and I know she is loving Heaven with the Lord and Bill. When she came to the 4:00 mass on Saturday nights I would greet her most of the time her kindness, her never ending smile and positivity soon turned into friendship, she was a good friend. I miss her and the hugs we shared.